You will have some interesting financial opportunities this month. Yet be aware that you may not be working with full information. Therefore, you will need to maintain a practice of due diligence. Check the bona fides of anyone you’re doing business with. Nothing is as good as it looks, and everything is subject to change. Love this horoscope? Read all Planet Waves horoscopes by Eric Francis. You can sign up monthly or for the full year. Aries (March 20-April 19) — There’s an old expression about not judging a person until you’ve walked a mile in their moccasins. You have the rare opportunity to do just that — experience the world from the viewpoint of a significant other. Part of that includes how they experience you. You might find that, as a result of this, you make some adjustments to your personality or to how you treat the people around you. Two changes would help: you can afford to listen more attentively, and you can afford to be more generous emotionally and financially. Open up and deepen your intimacy. For your Eric Francis horoscope this week, please see this link. Taurus (April 19-May 20) — You’re in a time of deep self-discovery. The implication of that is doing something bold, which is standing in the face of the unknown. Leave yourself room for the mystery of yourself. You don’t have to rush in and answer every question you have about yourself. The more room you leave for the unknown, the more space you’ll have for discoveries as they come — and there will be many over the next few weeks. Admitting that you don’t know takes some courage, especially here in the age of quick, short, incorrect answers. You want the slower, longer, more meaningful ones. For your Eric Francis horoscope this week, please see this link. Gemini (May 20-June 21) — If being popular is really a thing, you’ve got it going on now. Though you might consider the wisdom of the old esoteric teachers: beware of any false presentation of yourself. You are safer for being honest and real with the people around you. Amidst all the competing effort for attention in the world is a struggle with self-esteem. Someone close to you may need your attention; he or she may be reluctant to reveal their true feelings, so you will need to be perceptive and ask. You can offer them some extra space to be themselves. For your Eric Francis horoscope this week, please see this link. Cancer (June 21-July 22) — This is a stellar moment for you professionally, though the best results will come in ways you’re not expecting and cannot foresee. Be open to the possibilities, while keeping busy doing what you do so well. Your solar chart describes you as a person who must pour yourself into your work with total commitment. You identify with what you do and what you create. You need to be known for your accomplishments. This is an asset in a world of people who don’t often like going to work. You deserve your good reputation, as long as you live up to it every day. For your Eric Francis horoscope this week, please see this link. Leo (July 22-Aug. 23) — You seem unsure whether to have total confidence in your abilities, or to doubt yourself with the same devotion. There’s plenty of territory in between. True self-assurance is often informed by insecurity. You need to keep checking whether you’re on the right track, and whether your predictions or projections about the future are accurate. For example, review the budget of any project against the actual expenses on a regular basis. Make sure the content and tone of any message are correct for what you’re doing. As long as you navigate consciously, you will get where you’re going in excellent style. For your Eric Francis horoscope this week, please see this link. Virgo (Aug. 23-Sep. 22) — Who are all these people in your life? Where did they come from? You seem to go from feeling invisible to being a beacon. However, you would be wise to exercise discretion over who gets close to you. Get to know people before you invite them into your life, particularly on a romantic or financial level. That means giving people a chance. Try to spend seven hours with someone before making up your mind about whether to proceed. Rather than being skeptical, the idea is to keep an open mind and allow people to reveal themselves. Use what you learn. For your Eric Francis horoscope this week, please see this link. Libra (Sep. 22-Oct. 23) — It’s often said that relationships are mirrors, though that doesn’t factor in the phenomenon of the ‘mirror image’ — the reverse reflection. Others don’t see you that way; it’s a visual illusion. Now, however, you get to look into your relationships as what you might think of as a true mirror: one that shows you who you are, through their eyes. The first surprise you might have is that you seem to others very different from how you seem to yourself. The second surprise is that you’re likely to truly love and adore that unusual person being reflected to you. It’s about time. For your Eric Francis horoscope this week, please see this link. Scorpio (Oct. 23-Nov. 22) — You may be wondering whether a workplace romance is a good idea. It might be under other circumstances, though you need to be cautious of any situation that’s not convenient to walk away from. In whatever aspect of your life you may be considering, your agreements must be easy in, easy out. Still, you’re dealing with powerful forces of attraction. Many people will be noticing you, and responding openly. This gives you the power of choice. Err on the side of simplicity rather than of potential drama. You will still have plenty of fun. For your Eric Francis horoscope this week, please see this link. Sagittarius (Nov. 22-Dec. 22) — Focus on the art rather than the gallery opening; on the writing rather than the bestseller list; on the song rather than the concert. That is, substance is what matters most; how you present what you’ve created matters less, for now. Get the creative aspect of what you’re doing right. Put everything you’ve got into it. Fill it with your life energy. The presentation will come naturally once your project or idea has enough momentum of its own. When the time comes to go public, which seems inevitable, you’ll want to get it right the first time. For your Eric Francis horoscope this week, please see this link. Capricorn (Dec. 22-Jan. 20) — When you get a moment of clarity, you’ll be surprised how much you were missing. Once you know, you’ll benefit from paying attention to the emotional details that really matter. Your insecurities will inform you of where you have healing work to do. You have a right to feel grounded and secure. You’ve worked for it. Yet in this world, it’s necessary to maintain your sense of safety and self-preservation with constant vigilance, a little bit every day. Go easy on doubting yourself. You’re usually right, as long as you leave space and freedom to be wrong. For your Eric Francis horoscope this week, please see this link. Aquarius (Jan. 20-Feb. 19) — You present a serious, competent image to the world. People look at you and assume you’re intelligent. Then they hear what you have to say, and their hunch is confirmed. Therefore, you don’t need to impress anyone. And you have a pass to suggest things that might be a little offbeat — a little unusual or inventive — and be trusted. This trust is precious. Do your part to maintain it. Meet your commitments on time or a little early. The more you work within the accepted rules of society, the more creative and daring you can be. For your Eric Francis horoscope this week, please see this link. After the Eclipse: What Are You Here To Do? What have you discovered, and where are you within the shifting context of your life, now that two eclipses have come and gone? Are you feeling the fog of Sun-Neptune, or its optimism? Pisces is currently chock-full of planets and points that are likely enhancing your awareness and urging you to do something with what you are learning. Your upcoming 2017 Pisces Birthday Reading will be an essential guide to sorting out your inner world and how it intersects with the rapidly changing world around you. Your reading will include two audio segments of astrology (at least 30 minutes each), plus a tarot reading (either audio or video) and extended written description of your sign. You may download the audio portions and listen as many times as you like as the year progresses. Please note that the tarot portion may be ready after the astrology segments are released — and the reading’s price will increase when that happens. If you have a Pisces Sun or ascendant (or would like to give a gift to someone who does), you can pre-order the 2017 Pisces Birthday Reading for the discounted pre-order price of $19.97. In every audio birthday reading, Eric draws a clear connection between your present moment and environment, and long-term patterns that stretch into the past and into the future — and which influence your options. 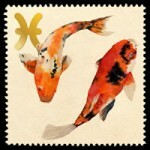 If you have a Pisces loved one, this audio reading will make a generous and inspiring gift. P.S. 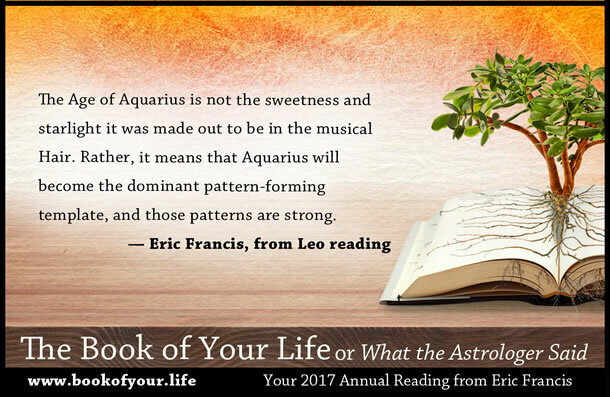 Your audio Pisces Birthday Reading is completely different from your written reading in the 2017 annual edition. Eric will record the Birthday Reading with the Sun in Pisces, giving a detailed, in-the-moment take on the most important parts of your astrology as they begin to unfold. Pisces (Feb. 19-March 20) — You will have some interesting financial opportunities this month. Yet be aware that you may not be working with full information. Therefore, you will need to maintain a practice of due diligence. Check the bona fides of anyone you’re doing business with. Nothing is as good as it looks, and everything is subject to change. Even given these facts, you will find some business possibilities that are genuinely appealing. Choose the ones that you resonate with intuitively. Choose what is truly meaningful to you, and work with those whom you can relate to on the human level. For a Pisces, this matters more than anything. For your Eric Francis horoscope this week, please see this link.